In 2004, Pro-Line developed an all-terrain tread that would rival all others. 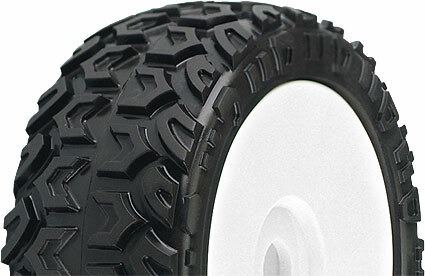 Today, that tread is available for 1:8 off-road buggy owners everywhere – introducing the Moab. The Moab tread is super agressive yet responsive enough on a mulitple of surfaces. It shines on a variety of dirt surfaces while maintaining unmatched control on street surfaces. Grass, fields, or sand are no problem for the Moab either due to its deep channels designed to dig in to the surface below.